A leading environmental group has filed a lawsuit against the Environmental Protection Agency, accusing regulators of dismissing dangers about a certain chemical used in herbicides, including Monsanto’s widely used Roundup. The lawsuit, filed Friday by the Natural Resources Defense Council (NRDC) in federal district court in New York, argues that an ingredient in the herbicide – glyphosate – has had devastating effects on monarch butterflies, causing the population to halve in seven years. Glyphosate destroys milkweed, the only food consumed by monarch butterflies in their migration. The lawsuit states that federal law requires the Environmental Protection Agency (EPA) to ensure that the pesticides it approves will not cause “unreasonable adverse effects on the environment, including wildlife.” The suit alleges the agency never considered glyphosate’s impacts on monarchs. A year ago, the NRDC and other environmental groups submitted a petition to the EPA asking them to review a large body of scientific evidence showing the effects of glyphosates, but the EPA did not respond to the petition. In response, the EPA issued a statement saying it is taking several steps to protect the butterflies, but that the science on the issue "is still evolving." "There are multiple factors that may be affecting monarchs including loss of habitat, weather and pesticides," the EPA said. The orange-and-black spotted monarchs are renowned for migrating several thousand miles across the US, Canada, and Mexico. The Center for Biological Diversity said their numbers have fallen dramatically in recent years. The lawsuit states the population was tallied at one billion in 1997 and this winter was down to 56.5 million butterflies, the second-lowest number ever measured. 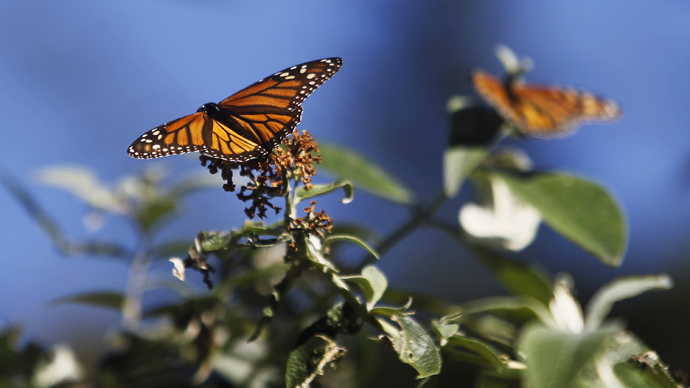 The suit seeks a court order forcing the EPA to evaluate glyphosate's effects on monarchs and impose measures to mitigate harm to the butterflies. The US Fish and Wildlife Service said at the end of December 2014 that it would conduct a one-year status review of the butterfly to determine if the species is warranted protection under the Endangered Species Act. This month it announced it was helping launch a $3.2 million campaign aimed at saving the butterfly’s habitat.